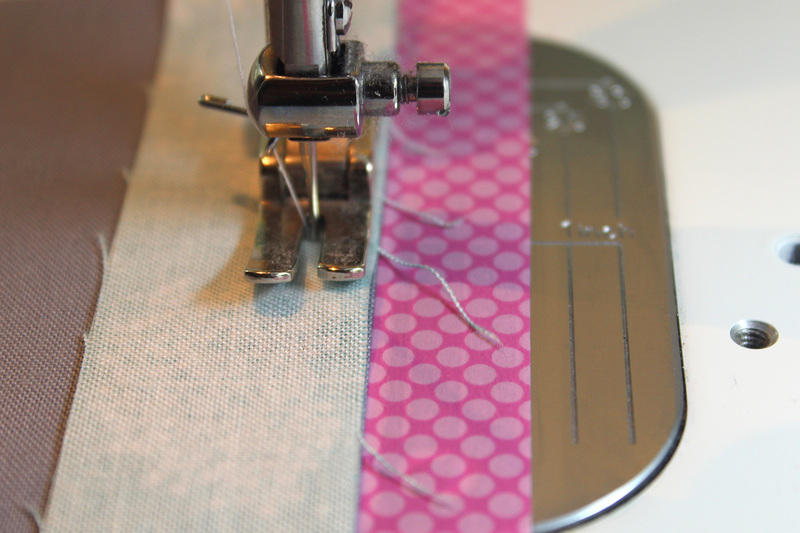 Sewing an accurate seam allowance is the number one thing I believe quilters need to get right. It’s not about being picky and perfect points. You guys know that I am not about that. But this is my number one for a reason. If your seam allowance is too shallow, your seam can come apart. If they are too deep, you will start getting bulky seams and losing block size. 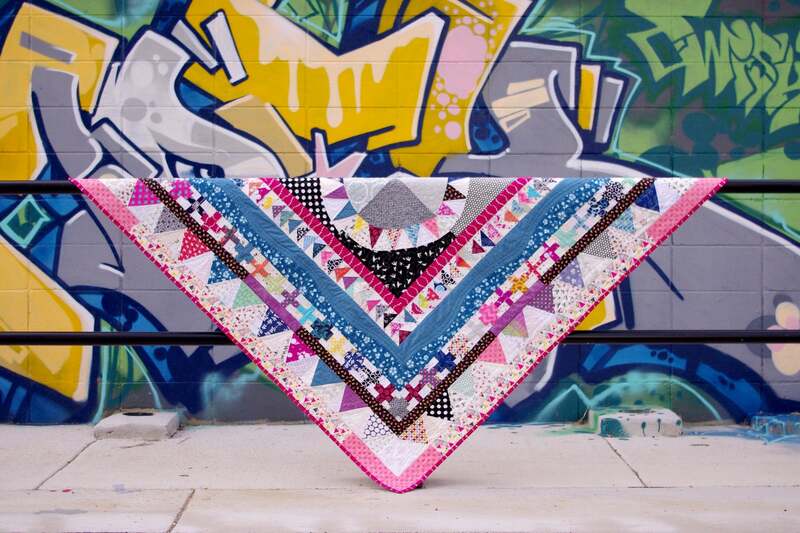 An accurate seam allowance equals a strong quilt and makes sure they will stand the test of time. 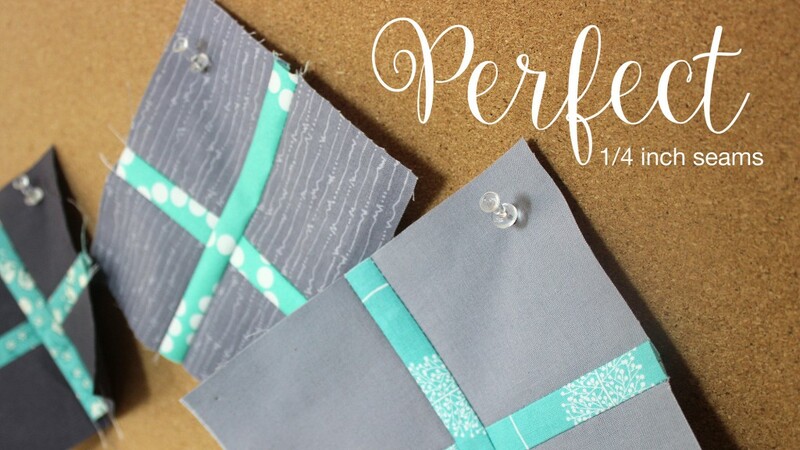 This tutorial will show you how to sew a perfect 1/4″ seam. I’ve mostly been dressmaking and free motion quilting lately so haven’t had to pay much attention to my ¼” seam allowance. Last week while I was sewing my first and second Project 48 blocks (which by the way is so much fun – I love this group so much. If you haven’t joined us yet, you totally should) and I noticed that my seam allowances were out. 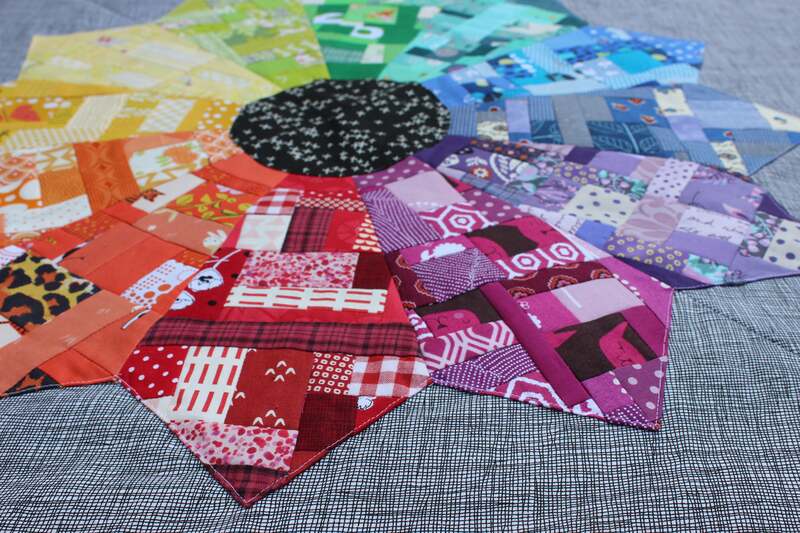 These blocks required accuracy and so I set about to reseting my seam allowance guide. General sewing supplies, including a square ruler, rotary cutter and mat. Step one: check out the seam allowance guides on your plate. This is our starting point. Now, place a ruler with ¼” markings under your foot, lower it to secure the ruler in place and set your needle straight on down to the first ¼” line. You can see in my picture that there is a little bit of a difference in these two. And that my foot is fluffy – remind me to clean that later! Step two: place a length of washi tape down against the ruler to create your guide. You might be wondering why there is a difference between the guide and the ruler. 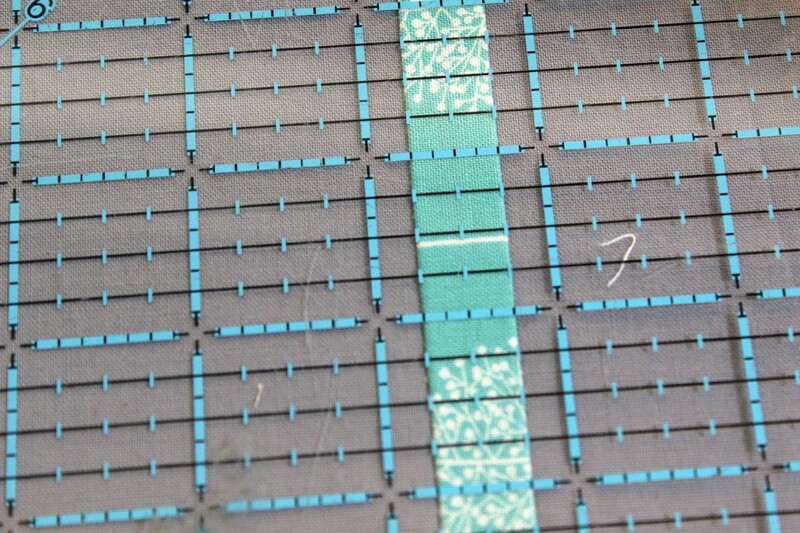 It’s because we are going to create a ¼” seam allowance which includes the thread. This is what’s called a scant ¼” seam allowance and can make all the difference to your seams. That teeny tiny little bit of a difference adds up over 400 squares and seams. Step three: cut your 6½” square in half with a rotary cutter to create two rectangles. 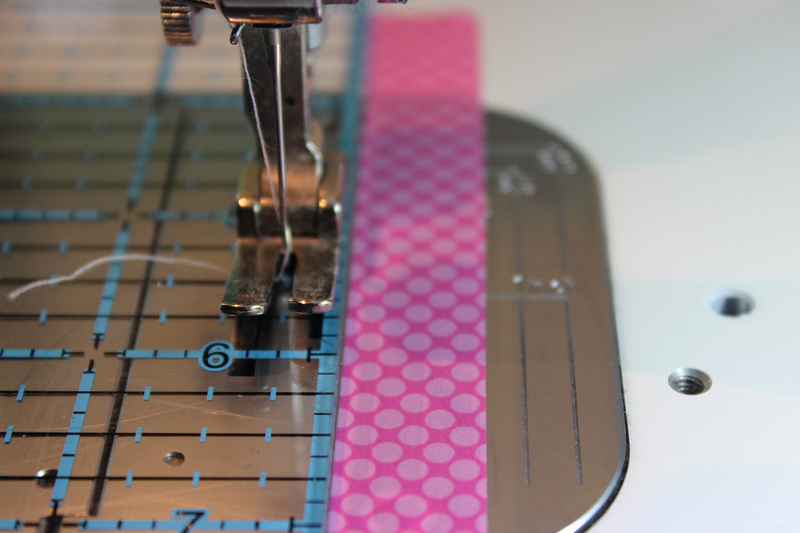 Insert the contrasting strip by sewing each side of the strip to each rectangle. Press your seams inwards. They should just meet in the middle. Step four: check your seam allowance is accurate by measuring your block. If you have it right, it will measure 6½” square and your strip will be exactly ½” wide. If your block is short, simply move your guide closer to the needle. If your block is too big, move your guide further away from the needle. 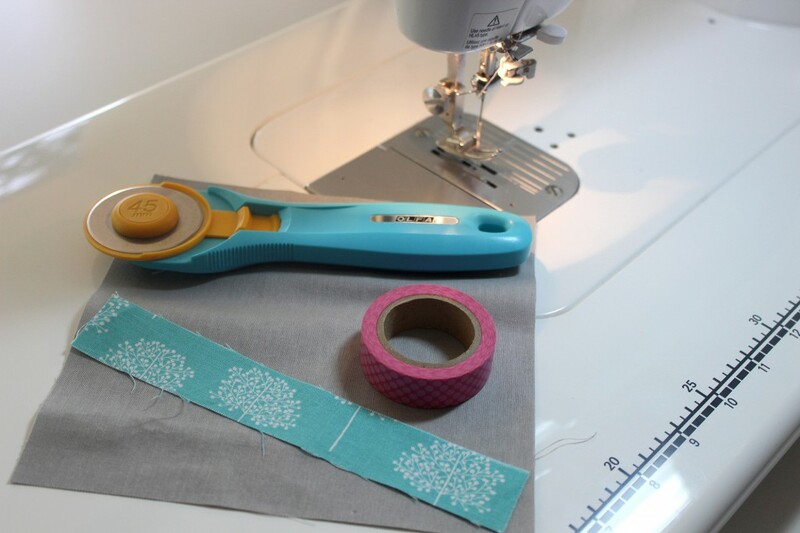 Cutting your fabric: when you slice your fabric with a rotary cutter and ruler, you should always line it up against the ruler and not your mat. Where possible cut with the grain of your fabric to avoid warping when handling the fabric. Thread weight: your thread is included in the quarter inch seam. 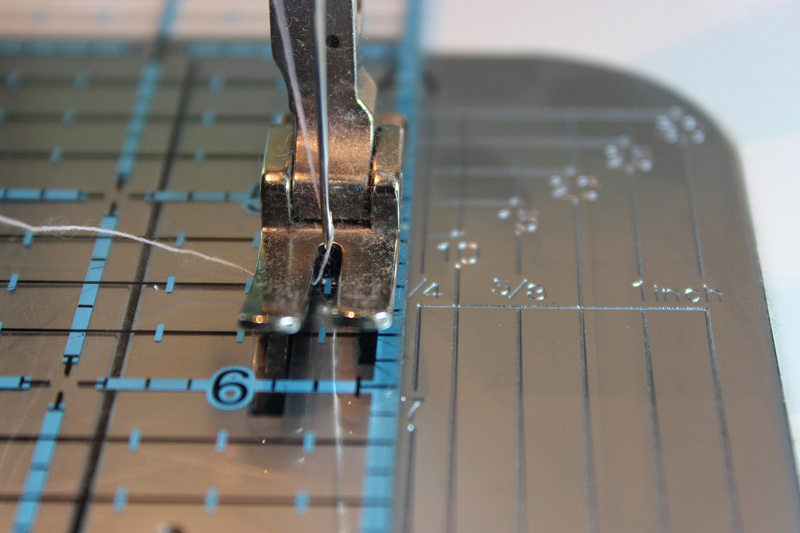 Depending on if you are using a thick or thin thread you may need to adjust your guide. Pressing: whether you press your seams to the side or open, you should have a hot iron, press seams as you go and press carefully to avoid puckers and pleats. When pressing, you will need to do it firmly, but not so much that you warp the fabric. A spray of your favourite starch (I love Mary Ellen’s Best Press) will assist you to get lovely flat seams. I hope this technique helps you sew a perfect ¼” seam allowance. Let me know in the comments if this works for you or if you have any tips to add. Thank you Crystal! This is really helpful! I’m so pleased to hear Gloria! Sometimes the simple things make a difference. And this is something that we should always check in on, no matter how long we have been sewing for! 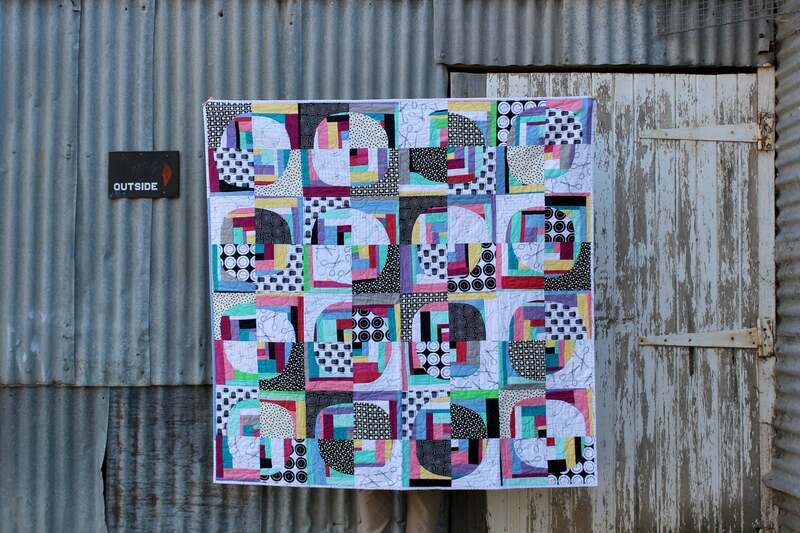 At my first quilt class, the teacher told us to use the outside of the measuring line on the ruler. The line is included in the measurement. Like you said, the tiny bit can add up. In Australia, Washi tape can be found at craft or stationary stores – I often grab some at typo. There are also many on line stores that stock washi tape. If you can’t find any, masking tape or blue painters tape would work too. Stay away from anything to sticky, as you don’t want glue residue on your machine.